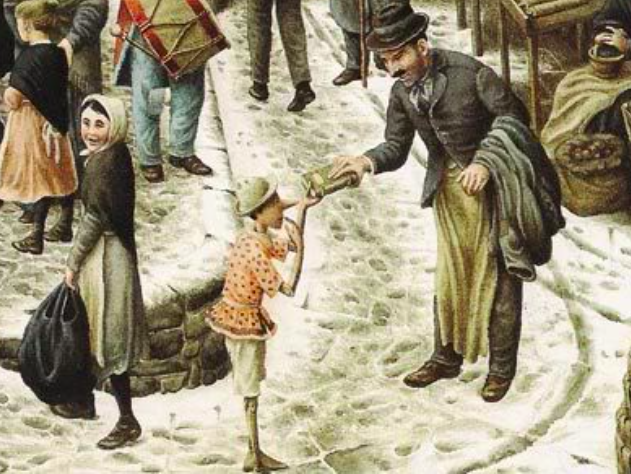 Pinocchio, the Liberal Arts and the Formation of the Ontological Boy | Libertas. Veritas. Studium. Pinocchio exemplifies most typical boys who see work and standard education as an unwanted chore. Beginning life as an inanimate block of wood Pinocchio simply seeks to satisfy his immediate impulses. The relationship of his run-away passions and being a block of wood clearly demonstrates that a great deal of formation awaits the puppet. His father, Geppetto, is the primary one who tries to mold the marionette into righteousness from the beginning. As a wise father, he realizes that Pinocchio must be educated in grammar, logic and rhetoric along with the every day realities of life at home in order for the marionette to grow closer to becoming a whole boy. Unfortunately, Pinocchio begins this journey towards boyhood by running away from true freedom towards impassioned slavery. As he walks to his first day of school, with spelling book in hand, a puppet show lures the marionette’s attention away from his duty. So taken by the desire to observe the show Pinocchio sells his book to buy a ticket to see what is happening in the theater. His unrestrained selfishness is an offense against his father who sold his only coat in the middle of the cold season to purchase that spelling book so Pinocchio could enter school. The education which Pinocchio was about to enter would have led to a liberating effect on him by answering his most important questions, encouraging him to grow in virtue, and awakening within him the highest ideals as Seneca famously wrote “only one study is truly liberal: that which gives a person his liberty. It is the study of wisdom, and that is lofty, brave, and great-souled.” So the freedom that Pinocchio sought was simply an action of enslavement to desire. Pinocchio’s unrestrained behavior in the theater with his like-minded fellow puppet friends nearly gets the marionette burned by the puppet master, Fire-Eater. 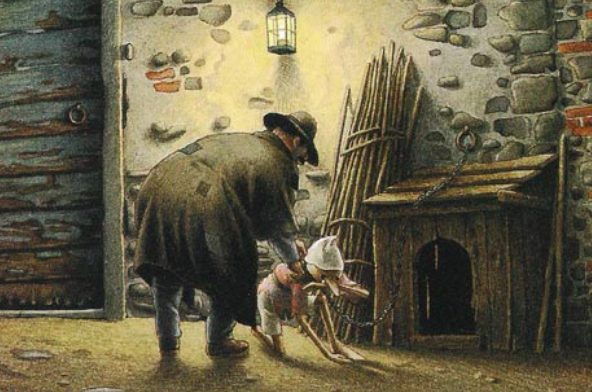 This hellish scene clearly alludes to an affect resulting from Pinocchio’s selfish, sinful behavior. Fortunately enough the young marionette’s pleas get him out of the fire, but his lack of character simply throws him back in again and again. After suffering several terrible setbacks Pinocchio attempts to return to the safety of the blue-haired fairy who had saved him from bandits in the past. As he travels down the road Pinocchio comes upon a giant serpent whose body covers his the entire path. The serpent symbolizes the tempter who presses desirous impulses along the marionette’s life, impulses which must overcome in order for him to grow into full boyhood. This time, instead of ending his journey or being sent astray from his path, Pinocchio does what he can to get around the serpent, but to no avail. Finally, he attempts to go over it, which causes the snake to awaken and strike and hold the marionette in place. As the serpent strikes it laughs at the puppet as it apparently intends not to let Pinocchio leave its grasp. The serpent laughs so hard, however, that it bursts an artery and dies. This scene signifies a great change taking place in Pinocchio’s heart. The serpent represents the evil one who intends to continuously tempt Pinocchio. The serpent’s laugh symbolizes the arrogant intention of the evil one to hold Pinocchio down through the marionette’s desires. The serpent’s death illustrates a uniting of Pinocchio’s mind and soul as his character begins to grow. Pinocchio’s traveling down the road and attempting to overcome the serpent thus represents a type of asceticism. He is traveling down the road to reach the blue-haired fairy who represents divine influence and mysticism that comes from grace received from asceticism. Now, even though Pinocchio still has a long, challenging road to travel where he must further undergo more struggles in order to grow in virtue, at least he has begun to recognize his errors and is taking steps to move closer to his goal of returning to his father and becoming a whole boy. “It serves me right. I was determined to be a vagabond and a good for nothing. I would listen to bad companions and that’s why I always meet with misfortunes. 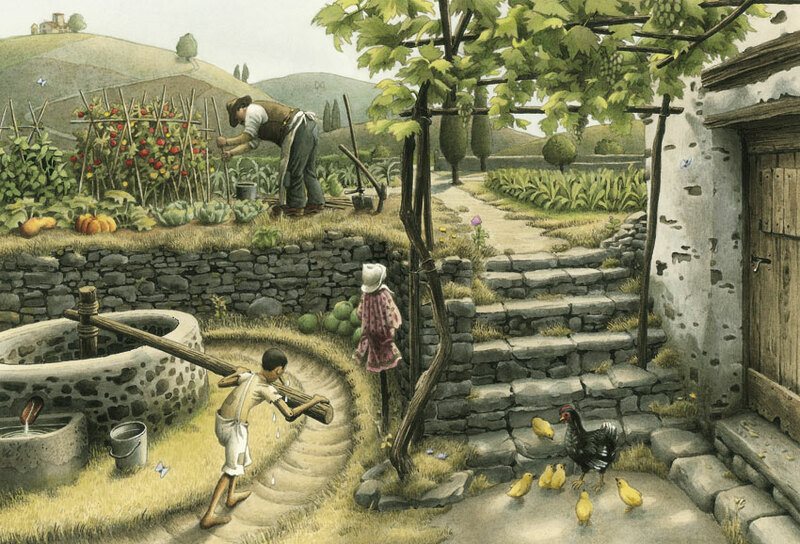 If I had been a good little boy as so many are, if I had been willing to learn and work, if I remained at home with my poor papa, I should not now be in the midst of the fields and obliged to be the watch dog to a peasant’s house. Oh, if only I could be born again. … Now I must have patience”. Here, Pinocchio acknowledges his errors and is repentant. Now his task is to keep watch, be concerned for others, and not submit to temptation. One of his first selfless acts comes during this time in confinement as he foils the chicken-stealing plot on behalf of the farmer. 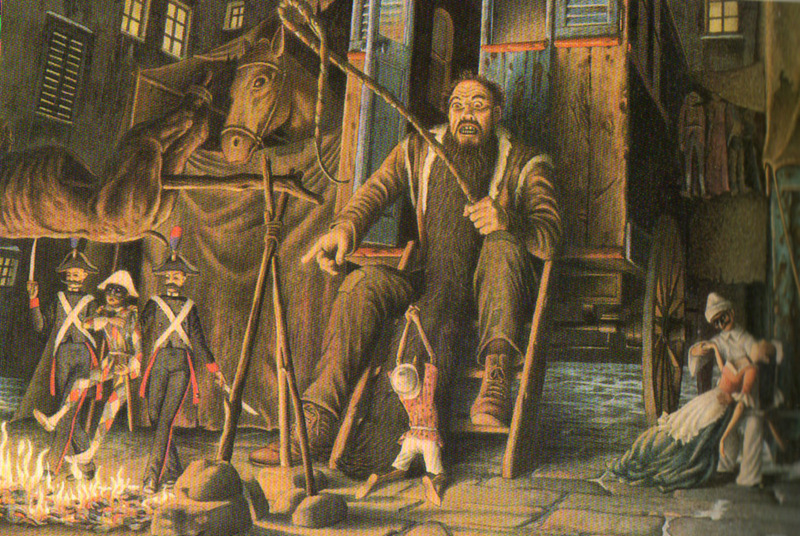 The farmer frees the puppet as a reward, which symbolizes his being set free to continue on his journey to boyhood, which he finally obtains after he completely sacrifices his will for the good of others, something of which a boy of good character would surely do.